Thanks again for responding, and I don’t mind when people disagree. Not all introverts have that skill, unfortunately. Approximately 15% of the population is HSP (Highly Sensitive Person), but 75% of HSP people are Introverts! One “feature” of HSP is that many of us hear… everything. I agree with you on the Red Sox fan. But I can’t imagine trying to write in a coffee shop! Thanks for the input, Vicki. For some reason, I have no problem writing with white noise in the background; but when it comes to reading, I have a problem. I am an HSP myself. You should do more writing, my friend. Bob et al: so one goes to a public place and sits within easy access to conversations with others, but really doesn’t want to talk to anyone? Why all the bother and fuss about being disturbed when all you have to say is – I’m sorry but I need to finish this work and perhaps when I ‘m finished we could discuss the Rex Sox – or whatever. Yet the setting is casual and your little girl is sitting next to you so why would someone bring their child to a place when their intention is to work? I’m glad that when my sons were younger there was no laptop, no cell phones, and no Starbucks. We used to spend time playing outdoors together, talking and laughing, not sitting next to each other without conversation. I’m not saying anyone who brings their child with them to a coffee shop etc is not a loving parent but it’s sad to see the disconnect with families in a setting like a restaurant where everyone is on the phone texting or talking to someone else. Just my two cents and sorry for if I offend anyone. Robert, I’m not offended at all. My inability to end a conversation is something I struggle with, but I can’t say the same for all introverts. Your second point is one I don’t bother explaining in detail–maybe I should–but my daughter and I are as close as any father and daughter can be. When she has homework and I need to concentrate, I ask her if she’d like to accompany me. Sometimes she does. One think about introverts for sure is they occasionally like to just be in the company of others, without talking. Extraverts feel the need for conversation–it makes me uncomfortable when there is silence. To your third point, I agree there is too much disconnect in families due to electronics, especially the Internet. Bob, I certainly relate to your post. 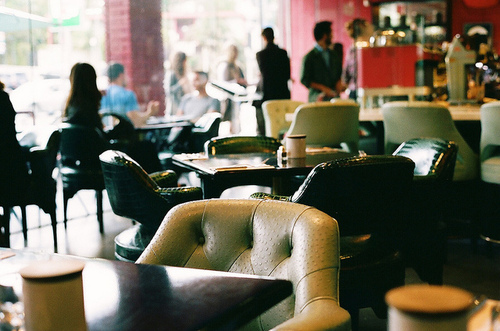 I can quite easily be alone in a crowd and have spent many hours in coffee shops writing. Whenever I am struggling with whatever I am working on, the ability to engage and people watch works well to clear my mind so that I can re-focus on the task. In most cases I can usually disengage quickly from anyone who wants to chat but occasionally it doesn’t work. It is interesting that I can block out global noise but get really annoyed with things like a ringing telephone if I am working intently in a quiet office. I think we’re on the same page when it comes to valuing our alone time. At the moment I’m taking a break from writing the last chapter of a book I’m writing, while my wife is distracting me by picking up the living room, including articles of clothing under my feet. There have been studies done that indicate that unexpected or inconsistent noise is more distracting than expected and/or consistent noise. The ringing phone is unexpected and inconsistent.